We’ve got lots of crafty things happening this weekend! We’re down to the wire for holiday shopping, right? What are you guys planning? Are you staying in town or braving the airports? Visual Shop SD will be showing “Homely for the Holidays” over the weekend starting today from Poortraits artist Nick McPherson. Visual Shop is open from 12-7pm on Fridays and 12-5pm on Saturdays and Sundays. 5pm: Whistlestop Bar hosts Stormy Lights Opening Party with deluxe re-crafted lamps by Garriss, music, videos, and a food truck. 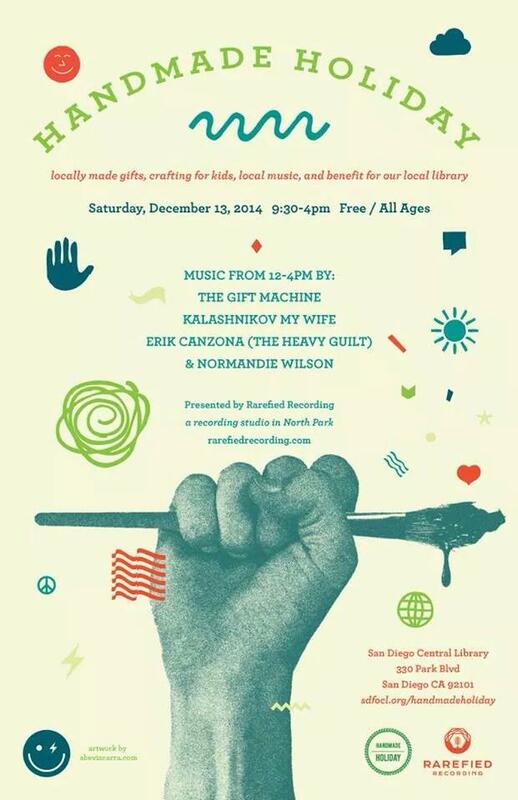 9:30am-4pm: The first annual Handmade Holiday features over 30 vendors, 4 local bands (including Erik Canzona from The Heavy Guilt), and various family activities all to benefit the San Diego Central Library. Music starts at noon. 12pm: If you’re shopping for the beer lover in your life… or you’d rather drink beer than watch local artists… then check out the Green Flash Grand Holiday Marketplace. 8pm: Old Main, a holiday horror radio play at Finest City Improv. Tinsel, mistletoe, and axe murders! 11am-11pm: This all day party will have everything for families and non-families. Sledding on real snow, an animal adoption area (adopt responsibly! ), skateboard demo, live music, and of course… beer! Bring new toys or clothes or a $5 donation to enter. 11:30am-4pm: Blind Lady Ale House hosts the annual Craft & Draft, organized by Laura Lande. Drink beer and buy local gifts. 2-5pm: If you’d rather not venture downtown to show your kids some good ol’ family fun, take them over to the Kensington Library Park on Adams. The event features Santa, snow, and the San Diego Creative Arts Project. 8-10pm: Long Story Short: Wild Card at Broke Girls. “What’s the topic? You decide!” This is an improv storytelling show. 5-9pm: Yelp presents Merry Marketplace at SILO in the Makers Quarter. This 21+ holiday shopping bazaar will feature local goods and Etsy artisans, entertainment, free bites, and drinks. 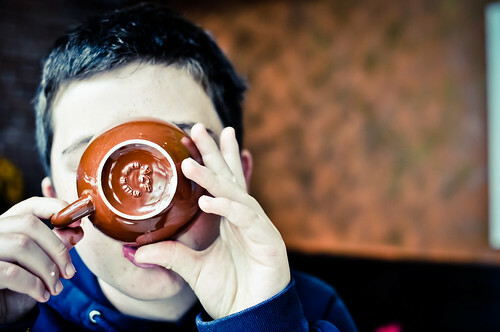 Have you guys seen the pictures of the new Linkery menu posted on their blog? It looks mouth-watering and delicious. I’m excited about their new selections! You can look at PDFs of their new menus here. Check them out starting tomorrow (Thursday) at dinner time. I just bought my significant other and myself tickets to Taste of North Park. I’ve previously walked around during Taste of Adams. Now that I’ve moved to North Park (well, kind of, but that’s another story), I’m excited to check out some restaurants and bars that I haven’t had time for yet, most notably El Take It Easy, Sea Rocket Bistro, North Park Fish Market and Grill, and The Smoking Goat. (And really, with a name like the Smoking Goat, I really should have visited a lot earlier!) I’m also excited to see that Urbn is listed as a tasting location. That place has been “coming soon” for awhile!